Prerelease for Magic: the Gathering! Our First Guilds of Ravnica Prerelease at Midnight after Friday Night Magic. Our Second Prerelease is Saturday the 29th at 4pm. Our Final Prerelease is Sunday the 30th at 1pm. 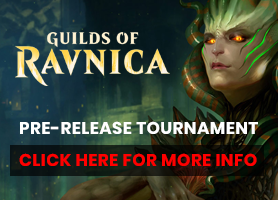 Entry for all Prereleases is $25. And their Format is SEALED. pick that Box up on Saturday or Sunday.